Delicious, cheesy, and comforting Zucchini Lasagna! This low carb recipe will give you ALL the feels of classic lasagna – but with less guilt by using zucchini noodles. Layers of garlic-y flavor, fresh basil, and so much cheesy goodness. 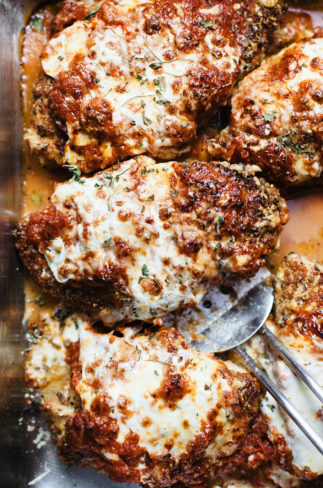 This recipe is soo delicious you won’t even miss using pasta! It’s no secret that I am a big fan of anything that has to do with pasta, luscious red sauce, and CHEESE. I’m obsessed with Italian food, but I try to keep it in balance because Italian cuisine tends to be higher in carbs. 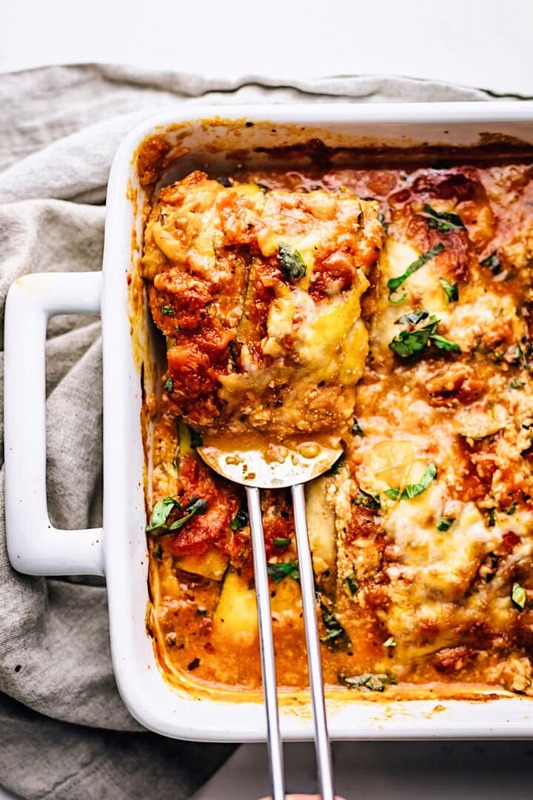 This week we enjoyed this delicious and savory zucchini lasagna. Yes, I said ZUCCHINI. As in, no pasta noodles – just layers of sliced zucchini, fresh basil, rich tomato sauce, and so.much.cheese! 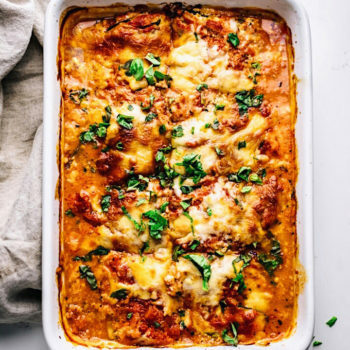 Lower carbs but still all the cozy, cheesy lasagna feels. This recipe is soo delicious and satisfying that you won’t even miss using pasta! Salt and dry zucchini. Lay sliced zucchini noodles on paper towels with a little salt over top. 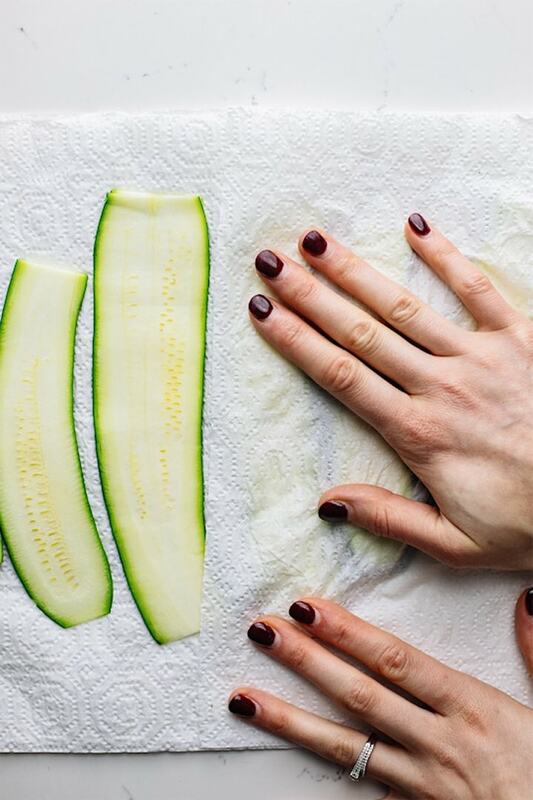 Let salt sit for 10 minutes then dry zucchini with paper towels – press down using hands to absorb as much moisture as possible. Choose your baking vessel wisely. 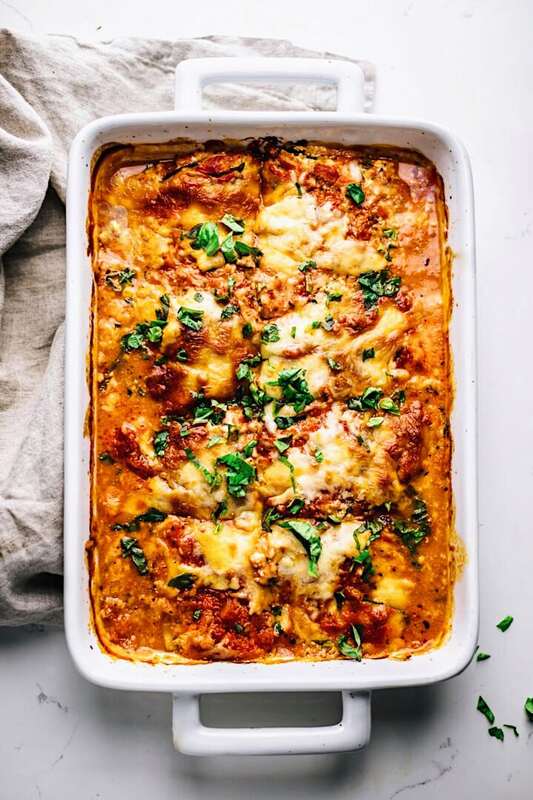 You want to make sure you bake your zucchini lasagna in a pan/dish that conducts heat well – like a heavy stoneware dish or stainless steel pan. (1) Mix basil, egg, parmesan cheese, salt & pepper, and minced garlic together in a bowl. 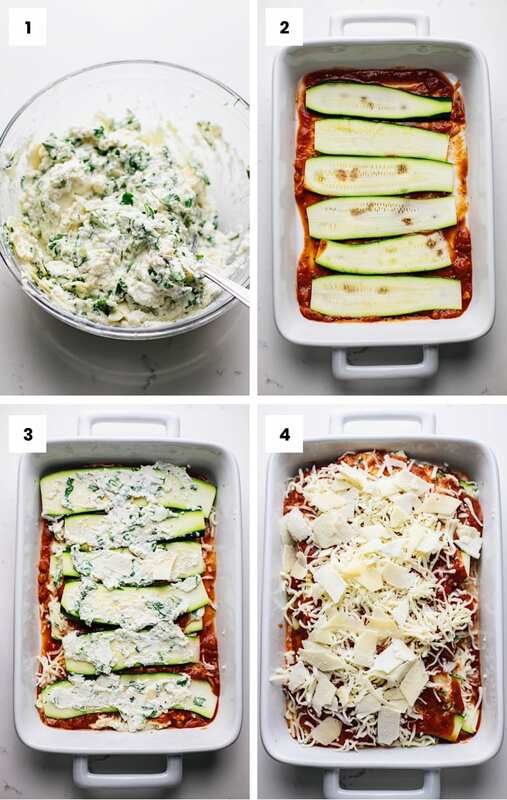 (2-3) After salting and drying zucchini slices start layering your lasagna in a 13×9 baking dish: thin layer of sauce, zucchini noodles, ricotta, mozzarella cheese. Repeat until finished. 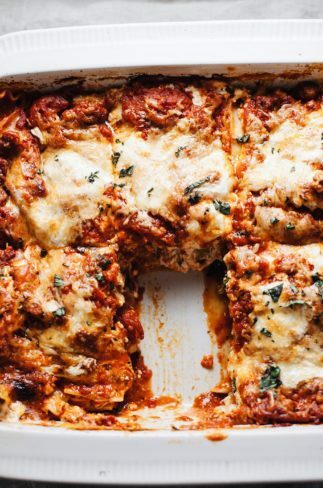 (4) Top lasagna with sauce, mozzarella, and parmesan cheese. Bake at 350F for 40 minutes then broil for 1 minute to brown cheese. If refrigerated or frozen, zucchini lasagna can be easily reheated. Quickly reheat a slice in the microwave for 1 minute. For refrigerated lasagna: preheat oven to 350F and reheat for around 15 minutes until warm. For frozen lasagna that is unbaked: let thaw and bake at 350F for 30 to 40 minutes until cheese is browned and bubbling. Use a mandoline slicer for slicing zucchini noodles. If you are experienced with a chef’s knife and feel comfortable, you can slice the zucchini noodles with a knife. Please be very careful doing this step. For this recipe you can use your favorite store-bought sauce or my family’s famous San Marzano Tomato Sauce. I used just fresh basil in this recipe to make it super simple. You can also add other herbs like oregano and thyme as well. Delicious, cheesy, and comforting Zucchini Lasagna! This low carb recipe will give you ALL the feels of classic lasagna - but with less guilt by using zucchini noodles. 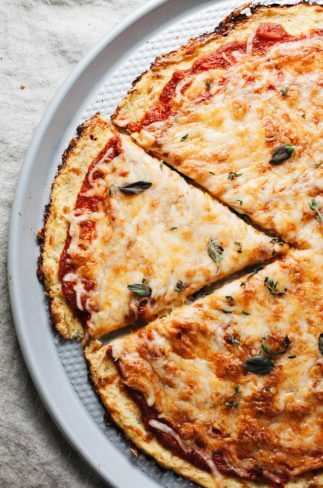 Layers of garlic-y flavor, fresh basil, and so much cheesy goodness. This recipe is soo delicious you won't even miss using pasta! See notes for how to slice zucchini noodles. Preheat oven to 350F. Lay zucchini noodles on paper towels and sprinkle with course sea salt - let sit for 10 minutes so zucchini sweats any access moisture. Use paper towels to press and dry zucchini noodles. Mix all of ricotta filling ingredients together in bowl. In a 13x9 baking dish/pan layer lasagna - thin layer of sauce, zucchini noodles, ricotta filling, and mozzarella cheese. Repeat until finished. On top layer with sauce, mozzarella cheese, and parmesan cheese. Bake for 40 minutes uncovered then broil for 1 to 2 minutes until cheese is browned. Sprinkle with chopped fresh basil. Slice and enjoy! Use a mandoline slicer for slicing zucchini noodles. If you are experienced with a chef's knife and feel comfortable, you can slice the zucchini noodles with a knife. Please be very careful doing this step. 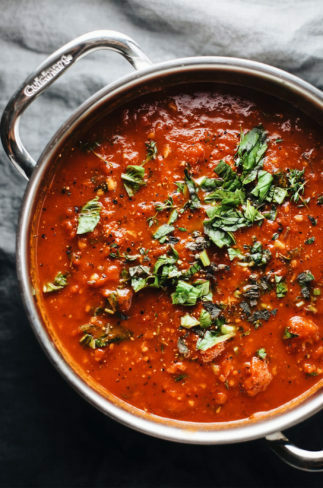 For this recipe you can use your favorite store-bought sauce or my family's famous San Marzano Tomato Sauce.